Founded in 2001, LightSpeed Technologies specializes in providing next-generation networking solutions that address the ever-growing need for bandwidth. We offer a full line of Nokia (formerly Alcatel-Lucent) solutions including Optical (DWDM), Data Networking (Ethernet, IP/MPLS), Microwave Radio and Ultra-Broadband Technology (FTTX, GPON, LTE) products, to support the Service Provider, Utility, Enterprise, Transportation, Public Safety and State & Local Government market segments. Since 2001, the combination of Nokia’s best of breed products and Bell Labs, coupled with LightSpeed’s exclusivity, renowned customer service and technical assistance has benefited our valued customers. 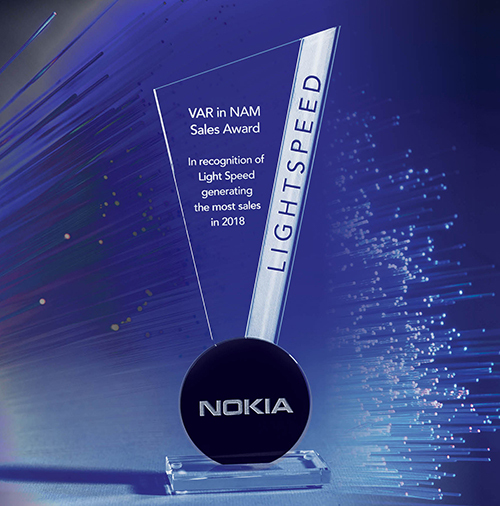 In recognition of LightSpeed receiving Nokia’s 2018 #1 Business Partner Award (for the Second Consecutive Year).